Sundae Says… A Human Kitten? Hi, furriends. Last week I had a truly amazing experience, and I wanted to tell you about it. It was Thanksgiving evening, and my Mom’s friend, Bev, came over to visit. Bev is my friend, too: she gives me scritches whenever she’s around. But this time….this time was different. When she came in the door, she was carrying… a tiny little purrson! Next thing I know, Motor Man is holding this baby purrson. 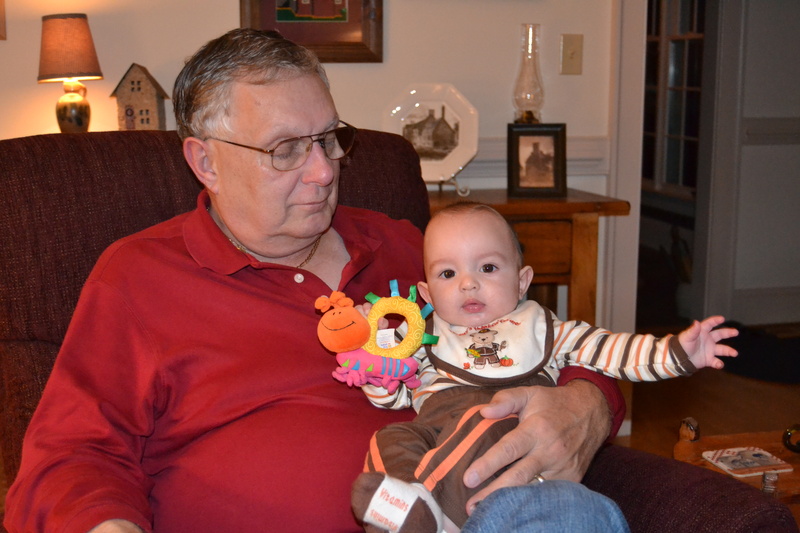 (They called him “Tanner”, and I heard Motor Mommy tell someone later that he’s Bev’s grandson). Motor Mommy actually put down the camera and held him some, too, but nobody took any pictures. I watched all this from a safe distance. As everyone played with this baby human, and he made odd little cooing noises, I was minding my own business in a chair on the other side of the room. Then, Bev brought him over to my chair. I think she wanted him to meet me. I was cool with that. I mean, maybe he was going to give me scritches too. But he got a little excited and suddenly patted his hand down on the chair, which scared me just a little. Do my ears give me away? But I was a good kitty and behaved. 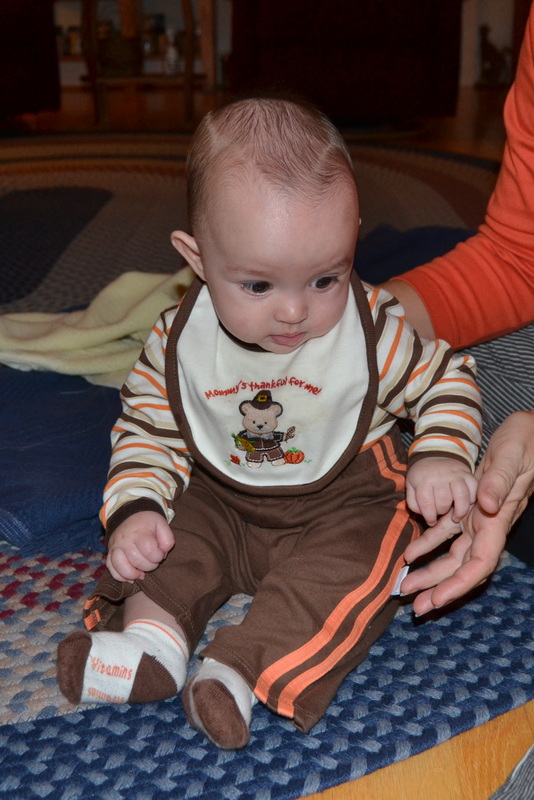 Meanwhile, Bev helped baby human practice his sitting alone skills. My boycatfriend, Sammy, told me that these little purrsons are sorta like human kittens. Tanner’s a cutie, but I sure hope my pawrents aren’t planning on getting one…. 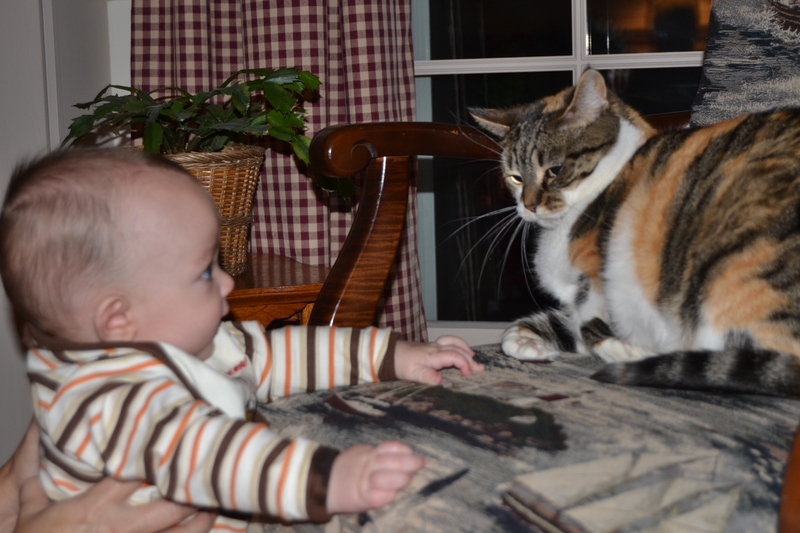 This entry was posted in Days at Home, Sundae and tagged babies, baby meets kitty, calico cat. Bookmark the permalink. Hi Sundae! So you met that little human kitten huh? He is cute but did you happen to notice how much help THEY need when they’re kittens vs. how WE were when we were kittens? We could sit up – run – eat – everything all on our own! Human kittens are a bit slower to “get it” aren’t they?!?! I think being CUTE helps them don’t you?? Hi Sundae, Ziggy watches his niecey-girls from a safe distance as well. Not to worry though; you probably just remind him of one of his loveypets in his toybox, cause you’re cute like that! That was really cute, tanner did like that furry kitty. I’m glad that Sundae behaved. My cats HATE children. Too noisy and unpredictable. I have to say: I see their point. This little purrson is sweet! Thanks for sharing your feelings about him .. cute! We love the pictures of the human kitten, Sundae! Our peep has human grandkittens who come and play with us. Love from Mattie the foxhound, Simone the collie and Eddie and Lucy, the JR’s. Oh and their peep. It’s OK Sundae, little kids scare me a little too! This little guy looks cute in Motor Man’s arm. Sundae’s always looking to meet a new friend ! We has 2 of those new little purrsons! We has not met them yet because they lives so far away, which is OK. Me met the first 3 and me used to go UTB as soon as me heard them outside! Aw! He’s a cutie! Sounds like the purrfect way to spend your Thanksgiving evening! 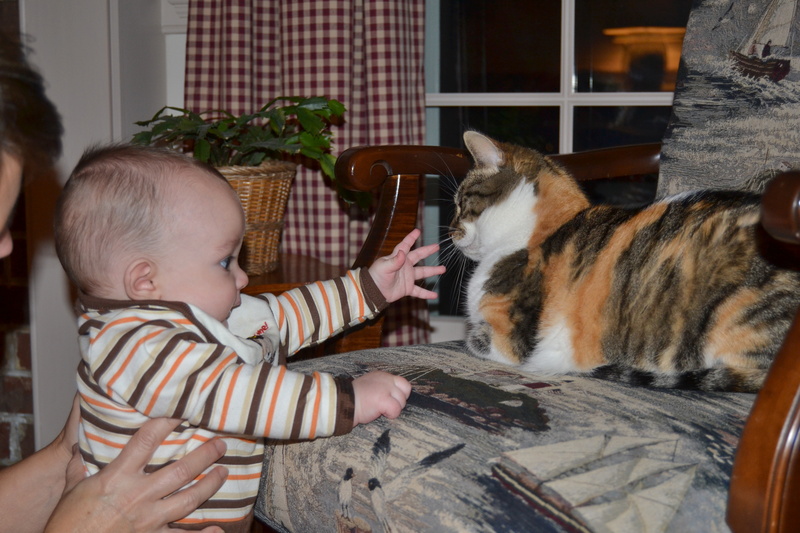 Aww … that little “purrson” is sure cute and so is Sundae-girl. Grand-daughter MJ has been here a lot of late and Frankie’s feeling a little left out. It occurred to me today that I use the same voice for both of them! You were quite well-behaved, Sundae. Those little purrsons are unpredictable, so you were being very wise. Sundae, you were very nice to Tanner. I’m proud of you. I have never seen a human kitten! They look kind of funny!